Recently, the Certified Sherry Educator graduates were celebrated all over social media streams. I was so proud and excited for my sherry-loving Twitter friends. I’ll admit I was also feeling extremely envious. I too want to join my friends as a Certified Sherry Educator. I wish I could toast them in person with a celebratory copita for their achievement! One such friend and graduate is Shawn Hennessey of Azahar Sevilla Tapas Tours. I had the privilege of meeting her last spring. Her blog about our visit is far more concise, so I’ll do my best to recount my experience without too many details. It was my last weekend in Jerez, and only by pure luck I had a cancellation to squeeze in a trip up to Sevilla. 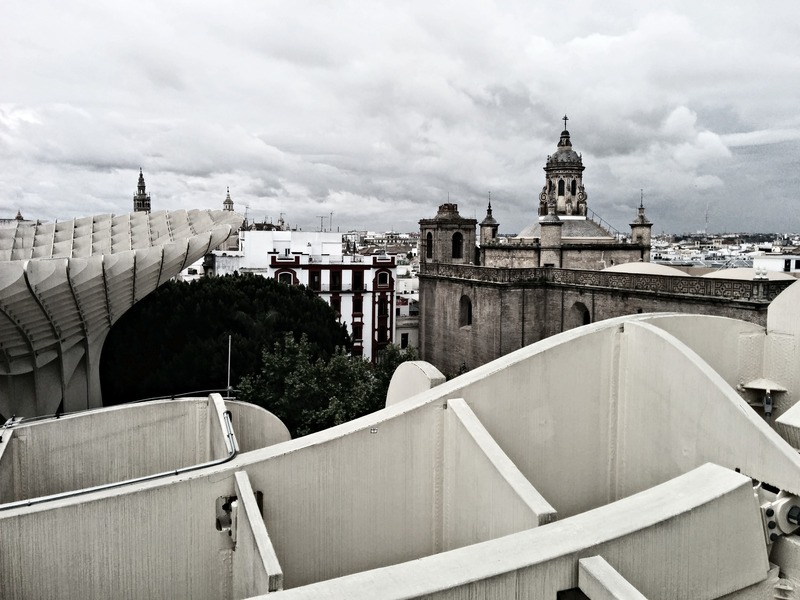 Using my GPS and WhatsApp with Shawn, I was able to navigate from my train to the bus that would take me to the Metropol Parasol, also known as the Setas, the Mushrooms. Let me be clear that my private tour with Shawn was far from the norm. Once we discovered we felt like two reconnecting friends, the entire day played out exactly that way! Having a one-on-one visit with Shawn gave me the chance to see Sevilla from her insider perspective, as well as learn her courageous story of beating stage-four colon cancer, and creating her ever-growing walking tourism business. We went up to the top of the Setas for a beautiful view of the city. 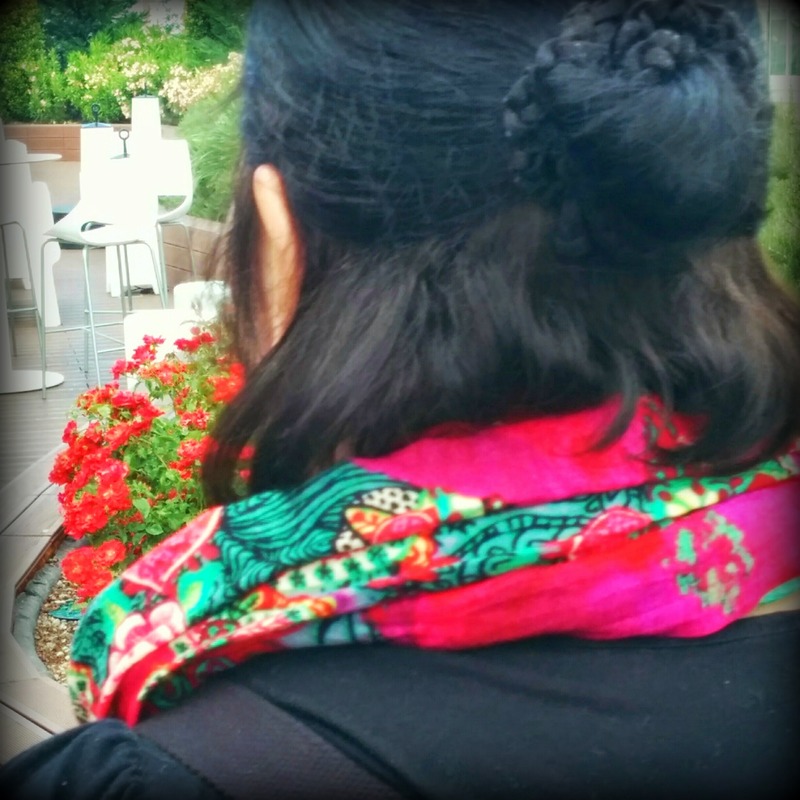 Shawn shared how she moved from Toronto, Canada to Spain without knowing any Spanish. She just knew that’s where she was supposed to be. I told her that despite studying for four months in Sevilla and studying flamenco in Jerez de la Frontera, I had never truly been tapa barhopping. Shawn was the perfect friend to make that experience happen to the extreme! We started in La Azotea in Barrio Santa Cruz, where a blonde Italian pixie greeted us. She helped kick off the day with a glass of cava and tostadas with tomato. The next stop was to the iconic Las Teresas, a classicly old bar with wooden floors, tiled walls and legs of ham hanging from the ceiling. We sipped the most delicious glass of Lustau Botaina Amontillado – served in a white wine glass upon Shawn’s request. The little nibbles of meat and cheese were all that was needed before moving onward. We popped in Casa Morales into its back bar. Shawn asked barman Diego for something special. He pour us a very cold glass of Sacristía AB Manzanilla Pasada to go with our bite of lomo en manteca. It was here when I felt our conversation go from casual chitchat to a level of transparency only friends can share. At one point we both went from teary eyes to sarcastic teasing and laughter. It was the perfect transition as Shawn led me her table in her “family’s” place, Bodeguita Romero, for the best pringá montadito in town! It was a packed Sunday brunch crowd and so loud, we had to practically shout to each other over our glass of Alfonso Oloroso from Gonzalez Byass. Shawn also ordered the famous papas aliñas, as well as braised pork cheeks to go with a glass of Palo Cortado Leonor from Gonalez Byass. When we left, I was already quite satisfied, but we had to make one more stop at La Brunilda. We were too full for their “crackburger,” so we enjoyed a Manzanilla Bota 55 from Equipos Navazos and some queso payoyo. As with many experiences in Spain, there’s always room for just one more! We wandered over to El Corte Ingles for a special treat at the Gourmet Experience! I was introduced to Silvia Flores. She is absolutely the sweetest, and has made a name and wine reputation for herself, despite being the daughter of Antonio Flores of Gonzalez Byass. She poured us glasses of the newest 2015 Tio Pepe en Rama. It was so refreshing! Then she spoiled us with glasses of Apostoles VORS Palo Cortado with a couple bites of Michel Cluizel dark chocolate. After that wonderful visit, I was ready for a break. Shawn invited me to her flat, where I met her flat-mate and her three adorable cats. A sherry lover AND a cat lover?! This day just kept getting better! I felt right at home. 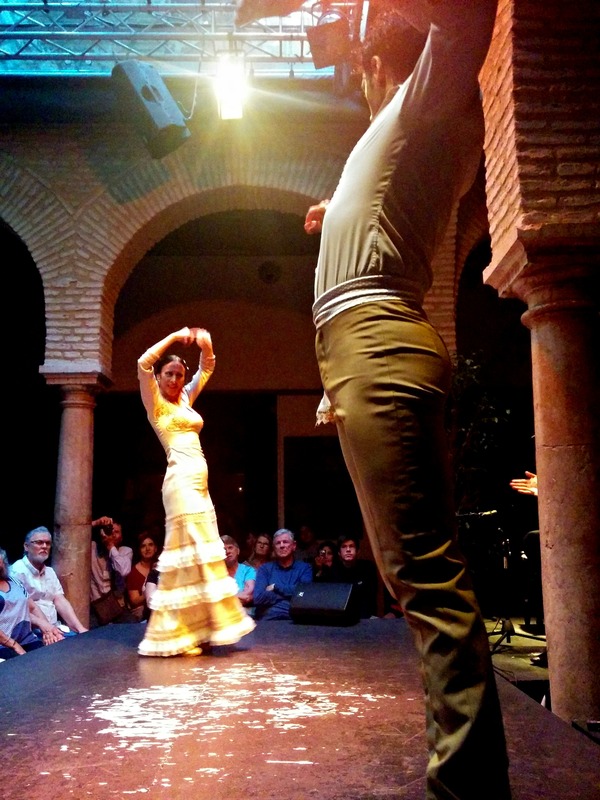 By the evening, I joined her Flamenco & Tapas Tour for the flamenco show at the Museo de Baile Flamenco. (I think I was the only one calling out jaleos in the crowd of tourists. I guess I’ve been spoiled by the flamenco peñas in Jerez.) After the show, we kissed our goodbyes, and I caught my train. I dozed off and nearly missed my stop. Thankful Shawn sent a text saying WAKE UP!! From start to finish, this day was perfectly orchestrated and meant to be. It makes me so happy to know Shawn is officially a Certified Sherry Educator. It is well deserved! 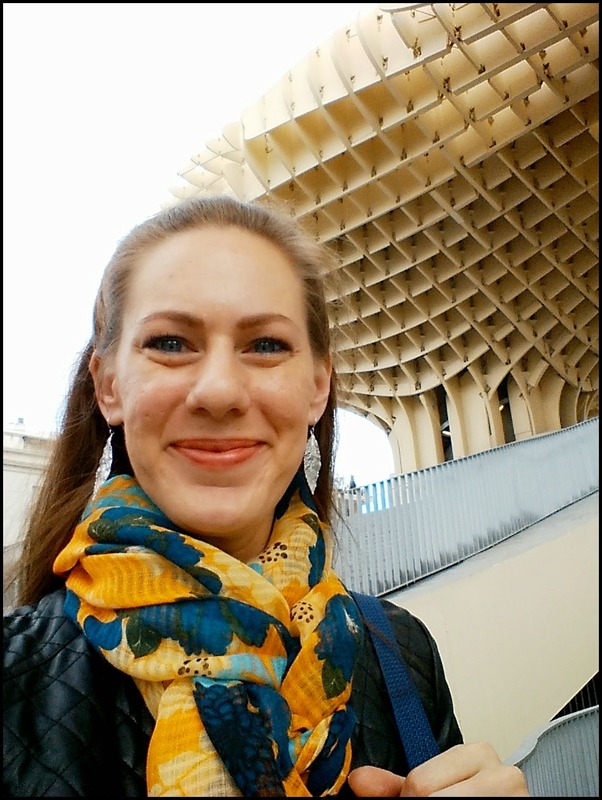 Next time you’re in Sevilla, be sure to take her tour and tell her @SherrySips sent you!